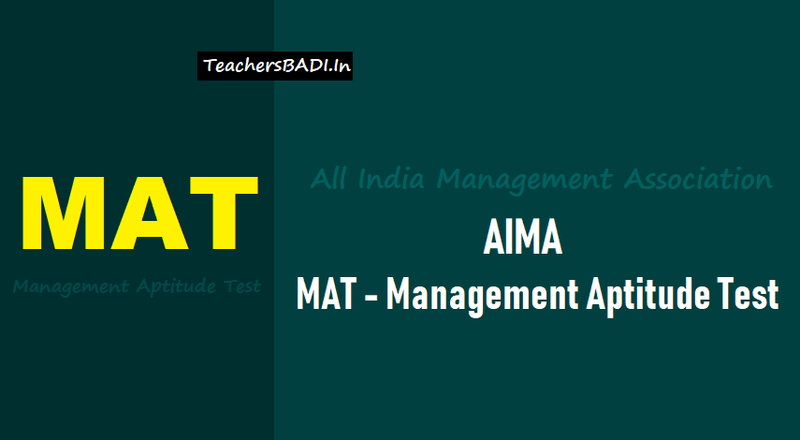 AIMA MAT September 2018, Last date to apply is 24.08.2018: All India Management Association (AIMA) invites Online applications for Management Aptitude Test (MAT) September 2018. Management Aptitude Test (MAT) is a standardised test being administered to facilitate Business Schools (B-Schools) to screen candidates for admission to MBA and allied programmes. All Indian Management Association (AIMA) has extended the registration date for Management Aptitude Test (MAT) 2018 exams. The extension is for both PBT & CBT modes. The new date for registration in the Paper-based test (PBT) is till December 04, 2018 and Computer based test is till December 10, 2018. Candidates can still register through the official site of AIMA at aima.in. The PBT, Paper-based test will be conducted on December 09, 2018 and the admit card is already released on the official site of AIMA on December 01, 2018. The CBT, Computer based test will be held on December 15, 2018, and the admit card will be released on December 11, 2018. Candidates who still have not applied for the examination can do this by visiting the official site of AIMA. Click on the link available for MAT 2018 and fill in the necessary details and apply. Candidates can apply for single PBT or CBT test or can apply for both. The single test needs Rs 1550 as registration fees and for both, candidates will have to pay Rs 2650. MAT 2018 examination is the entrance test for candidates who want to take up MBA admissions and allied programmes. Any B-School considers MAT score as an admission input based on the Score Cards issued to the candidates. Mode of Test: Paper Based Test (PBT) or Computer Based Test (CBT) or Both PBT & CBT. All provisionally registered candidates for PBT and/or CBT have to download their Admit Card from AIMA website link: https://mat.aima.in/sep18 as per the schedule given above. Admit Card contains Candidate's Name, Form No, Roll No, Test Date, Test Time and Test Venue Address. Candidate has to strictly follow the date and time allotted to him/her in the case of CBT. Candidates have to download the MAT Score from AIMA website http://www.aima.in on or after 21st December 2018. Last date for online registration(for PBT): 04.12.2018. Last date for online registration(for CBT): 10.12.2018. Paper Based Test (PBT): 09.12.2018. Computer Based Test (CBT): 15.12.2018.